Quality Fuel. Round-the-Clock Care. Expert Staff. Eshenaurs doesn’t skimp on anything. Our Harrisburg, PA customers stay with us because we are committed to the utmost quality and care in the heating oil and home comfort business. Since 1928, the Eshenaurs staff has believed that the best way to run a business is to have quality products and services. Our heating oil is free of impurities and burns clean. Our fuel contains additives that improve your heating system’s performance, making your equipment run more efficiently and increasing its lifespan. Since our inception, we have been committed to being a family. We don’t simply sell oil and provide heating services to our customers. We provide our employees and our customers with the highest esteem and respect possible. Our professionals are all certified and highly trained. We offer round-the-clock services that help ensure your family stays safe. We won’t oversell you, and we bring the services you need to get your home efficient, safe, and comfortable. Eshenaurs only brings quality to the table with a no-hassle policy. Know that when you choose Eshenaurs, you get professional, accurate advice, quality workmanship, and honest pricing. We take calculated risks that will help our business move forward and give our clients superior options. We care about our friends and neighbors. Whether having been sponsors in the Blanket Drive or simply finding ways to help everyone afford their upgrades and heating oil, we have supported our community since the Great Depression. We are proud to be a locally owned company with both third and fourth generation members contributing to the business. 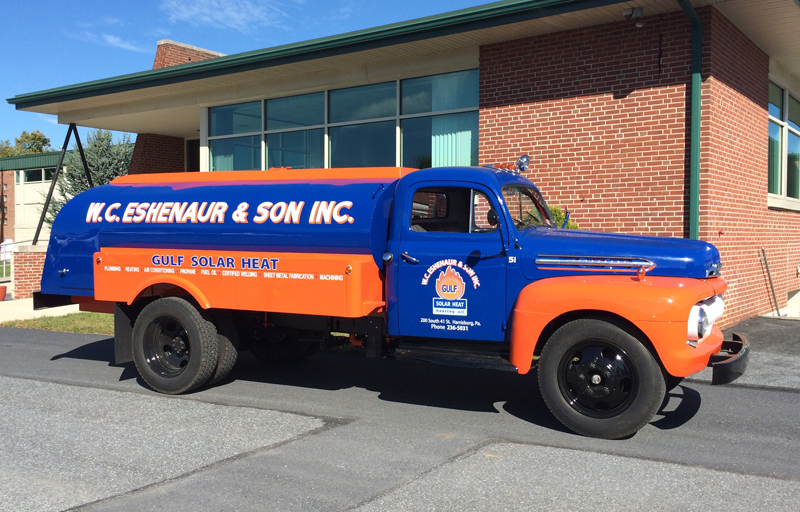 In 2009, Wally Eshenaur, the great grandson of Walter C. Eshenaur, began a side project to restore the original heating truck that was purchased by the company in 1951. While the revamped truck won’t be making any deliveries, we are proud to showcase our family history!